Apparently, there used to be 33 greyhound racing tracks in London. Now there are only four. And in August, arguably the most famous one will close, making way for a housing or retail development. The country is no longer going to the dogs, apparently. Tonight, however, I did. 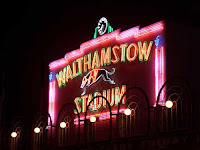 Ruth, Mona, Steve, Lynn and Stacy joined me at the iconic Walthamstow Stadium for a ‘six pack special’ – entrance, two drinks, two £1 bets and a dinner of chicken or scampi and chips – all for £17. A bargain. Shelley was there too, with friends, in the posher restaurant part of the stand (£20) and joined us at various points throughout the evening. I will be sorry when the track closes. Meetings there always turn into a great night out and last night was no exception. I held my leaving drinks there when I departed from BITC. We had a Christmas party there a few years ago when UKCAF was a very small organisation. The heady combination of cheap food, impenetrable form books and low stake gambling is very difficult to beat. I will try and visit just once more before the old place closes and becomes a gated community.